Tangunikia Ward, a single mom of two who has been unemployed for the past couple of years, was shocked when her St. Louis family was kicked off Missouri’s Medicaid program without warning last fall. She found out only when taking her son, Mario, 10, to a doctor to be treated for ringworm. When Ward, 29, tried to contact the state to get reinstated, she said, it took several weeks just to have her calls returned. Then she waited again for the state to mail her a long form to fill out attesting to her income and family size, showing that she was still eligible for the state-federal health insurance program for the poor. Mario, who is in third grade, missed much of school in December because Ward could not afford a doctor visit without Medicaid. His school would not let him return without a doctor’s note saying he was no longer infected. Ward and her children are among tens of thousands of Medicaid enrollees who were dropped by Missouri and Tennessee last year as both states stepped up efforts to verify members’ eligibility. Last year, Medicaid enrollment in those two states declined far faster than in other states, and most of those losing coverage are children, according to state data. State health officials say several factors, including the improved economy, are behind last year’s drop of 7 percent in Missouri and 9 percent in Tennessee. But advocates for the poor think the states’ efforts to weed out residents who are improperly enrolled, or the difficulty of re-enrolling, has led to people being forced off the rolls. For example, Tennessee sent packets to enrollees that could be as long as 47 pages to verify their re-enrollment. In Missouri, people faced hours-long waits on the state’s phone lines to get help in enrolling. Medicaid enrollment nationally was down about 1.5 percent from January to October last year, according to the latest enrollment data available from the federal government’s Centers for Medicare and Medicaid Services. Herb Kuhn, president and chief executive of the Missouri Hospital Association, said the state’s efforts to verify Medicaid eligibility could be tied to an increase in the number of people without coverage that hospitals are seeing. In 2018, Missouri Medicaid began automating its verification system. People who were identified as ineligible, for income or other reasons, were sent a letter asking them to provide updated documentation. Those who did not respond or could not prove their eligibility were dropped. The state does not know how many letters it sent or how many people responded, said Rebecca Woelfel, spokeswoman for the Missouri Department of Social Services, which oversees Medicaid. She said Missouri Medicaid enrollees were given 10 days to respond. Woelfel cited the new eligibility system, the improved economy and the rescinded federal tax penalty for people who lack insurance as factors behind the decline in enrollment. Missouri’s unemployment rate dropped from 3.7 percent in January 2018 to 3.1 percent in December as the number of unemployed people fell by about 17,000. Missouri Medicaid had almost 906,000 people enrolled as of December, down from more than 977,000 in January 2018, according to state data. About two-thirds of those enrolled are children or pregnant women. Timothy McBride, a health economist at Washington University in St. Louis who heads a Missouri Medicaid advisory board, said the state’s eligibility system has made it too difficult for people to stay enrolled. Since low-income people move or may be homeless, their mailing addresses may be inaccurate. Plus, many don’t read their mail or may not understand what was required to stay enrolled, he added. “I worry some people are still eligible but just did not respond, and the next time they need health care they will show up with their Medicaid card and find out they are not covered,” McBride said. Tennessee’s Medicaid enrollment fell from 1.48 million in January 2018 to 1.35 million in December, according to state data. Tennessee Medicaid spokeswoman Kelly Gunderson credits a healthy job market. The state’s unemployment rate was relatively stable last year at under 4 percent. “Tennessee is experiencing a state economy that continues to increase at what appears to be near-historic rates,” she said, which is improving Tennesseans’ lives and decreasing their need for Medicaid coverage and the Children’s Health Insurance Program. She added that the state has a “robust appeals process” for anyone who was found ineligible by the state’s reverification system. 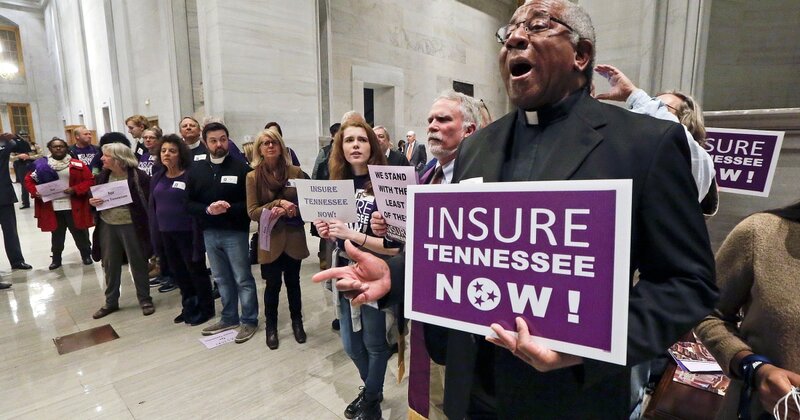 The Tennessee Justice Center, an advocacy group, has worked with hundreds of families in the past year trying to restore their Medicaid coverage. The verification process will make Medicaid rolls smaller and save money, “and that’s a poor way for the state to measure success,” said Michele Johnson, executive director of the nonprofit group. It’s penny-wise and pound-foolish, she added, because it leads to patients showing up at emergency rooms without coverage — and hospitals have to pass on those costs to everyone else. After rapid growth since 2014, when the Affordable Care Act expanded health insurance coverage to millions of Americans, Medicaid enrollment nationally started to fall, declining from 74 million in January 2018 to about 73 million in October, according to the latest enrollment data released by the federal Medicaid agency. Missouri and Tennessee are among 17 states that have not expanded Medicaid under Obamacare. But many of those non-expansion states nevertheless saw enrollment grow, because as people tried to sign up for insurance on the exchanges, those meeting state criteria were routed to Medicaid. McBride, the health economist, said the steep drop is especially disconcerting because most of those affected are children. Because children are eligible for Medicaid or the Children’s Health Insurance Program with family incomes as high as 300 percent of the federal poverty level, or $77,250 for a family of four, he said, it’s unlikely that a parent’s change in job would be enough for a child to lose eligibility. Legal Services of Eastern Missouri, which advocates for low-income residents, estimates that nearly 57,000 of those dropped from the Medicaid rolls were children, a decline that is nine times the national average. Missouri’s 70,000-person drop in enrollment, he noted, marks the biggest single-year reduction since 2006, when the state instituted tighter eligibility levels for certain groups. Joe Pierle, chief executive officer of the Missouri Primary Care Association, a trade group representing community health centers, said he doesn’t think that the state is doing anything “underhanded or nefarious.” Nevertheless, he’s not sure Medicaid officials did enough to reach out to people before dropping them. “I suspect some people are falling through the cracks,” he said.